Today I am thinking about the holidays and what I want to make for Thanksgiving dinner next weekend. Every year, I always brainstorm and think up new, creative and amazing dishes in my head and then it comes time to start doing my holiday grocery shopping and it’s 99% guaranteed that I will make all the classics that I had growing up as a kid. Maybe not everything is true to the thanksgiving or christmas dinners I had as a girl but most of the really comforting dishes of my youth tend to appear at my own family table over the holidays because it’s how I like to remember it. It probably has something to do with the fact that we don’t have any family around and very rarely do we have them visiting during the most expensive times of the year so making dishes that I find comforting are a way to feel like my fam is right here with me. Today i’m feeling nostalgic and remembering my mom when she was in her glory. Having family round for a big holiday feast and making something that absolutely everyone loved made my mom light up and really come alive. I’m sure the red wine helped as well but my mom loved nothing more than to be surrounded by a good crowd of people to share some big belly laughs with. She was a 5 foot nothing, brash Scottish woman that always told you what she thought (whether you liked it or not) but had a heart of gold underneath that tough exterior. Something that always baffled my mom was the fact that I never ever ate potatoes when I was young…can you imagine growing up with a Scottish mother, a German father and I would not eat a single potato??? Eventually they gave up. 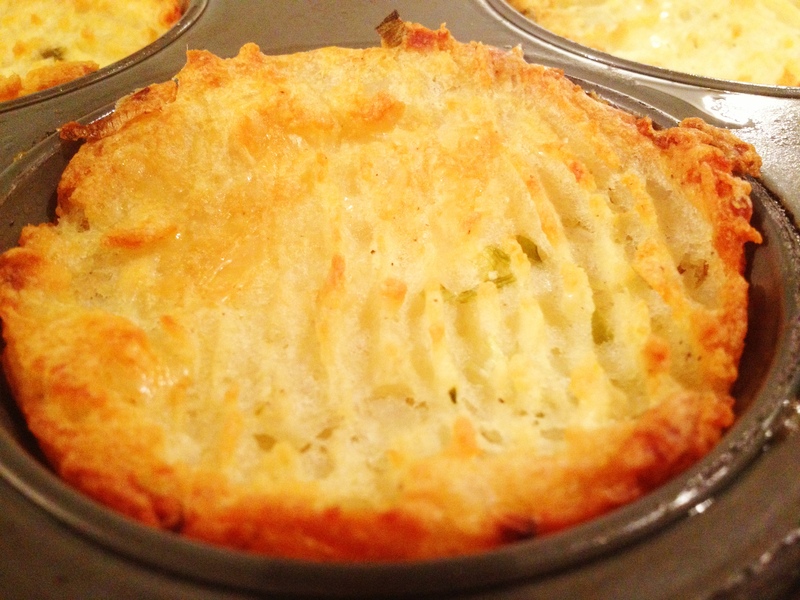 As I got older, I started to actually like potatoes and started to actually cook with them. Seriously, I don’t think I touched a potato that wasn’t a fry until I was in my mid twenties. After my mom departed, I went through phases where I missed her so much and I found making some of the comfort food dishes she used to make was really a way to have her close to me. I remember wee Janette making these potatoes every holiday and they really were original and off the hook amazing…too bad I learned this many years later when I grew up a little. 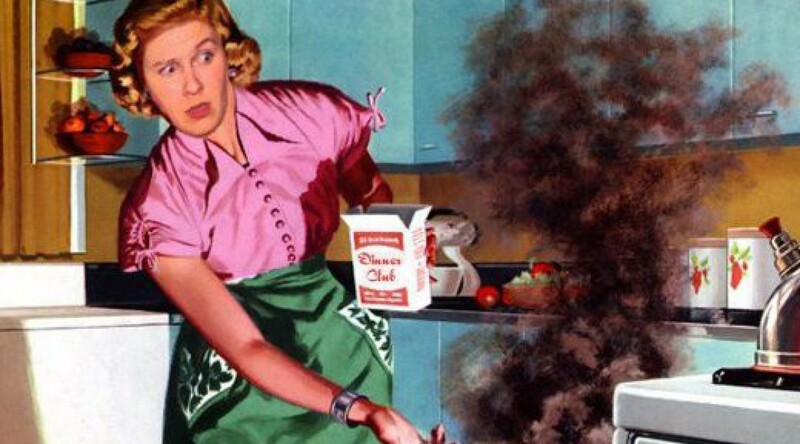 Over the years I have modified a few things to make them all my own and to be honest, my mom was not an adventurous eater at all and a bit of a plain jane in the food department. I like to jazz these babies up depending on my mood, the occasion or even who is coming to visit. 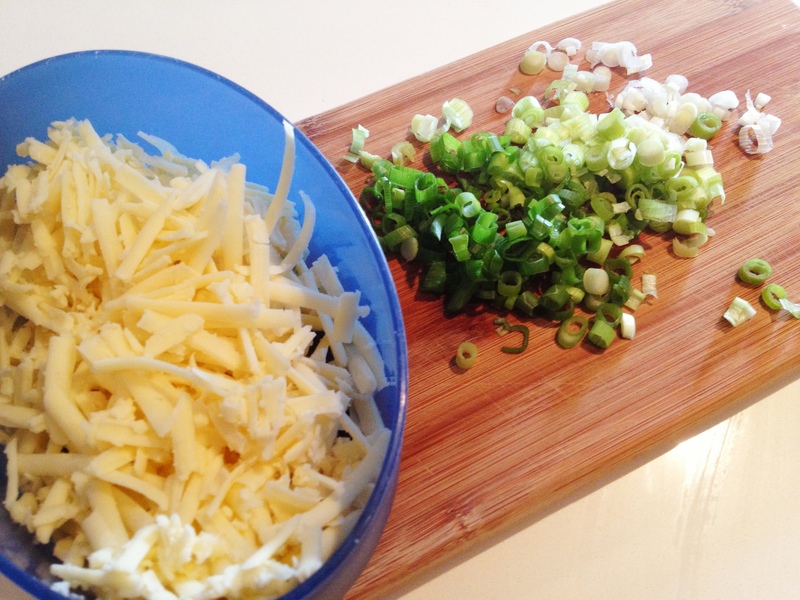 Today i’m going to use some simple ingredients, extra old cheddar and green onion. 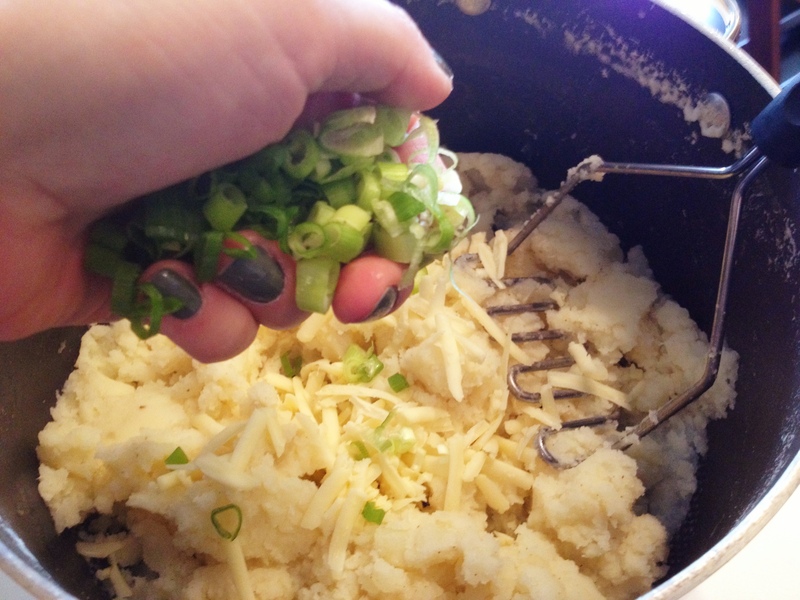 Extra Old Cheddar and Green Onion…winning combination!! Basically take some potatoes, peel them and boil them. They will be ready when you can stick your fork in to it and it slides right back out. Drain your potatoes and pour them back in to the pot they were boiled in (it’s the holidays people…no need for more unnecessary dishes). Next you will take your potato masher and mash the potatoes, add a nice size pad of butter (or margarine) or two or three…depending on how many potatoes and how delicious you think you want these to be. Add some salt (even some herbamare brand sea salt seasoned with herbs…so good) and pepper. 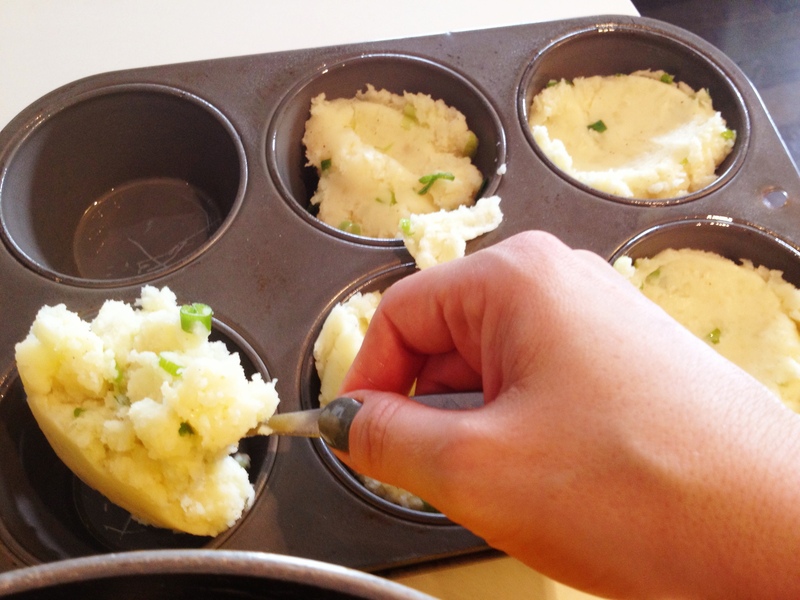 Now, you can stop there if you want and proceed to greasing your muffin tin with either olive oil or butter…or you can get uber creative and add a few things to jazz up your mashed potatoes. I love to add cooked bacon, cheese, green onion or sometimes a bit of boursin cheese, rosemary and garlic, butter and parsley…the possibilities are endless!! If you do add any fixin’s to these, mix that all around, season a bit more with salt and pepper if you want depending on your taste buds. Okay so here is a tip…that’s what I am using to describe the lecture that’s about to happen here. 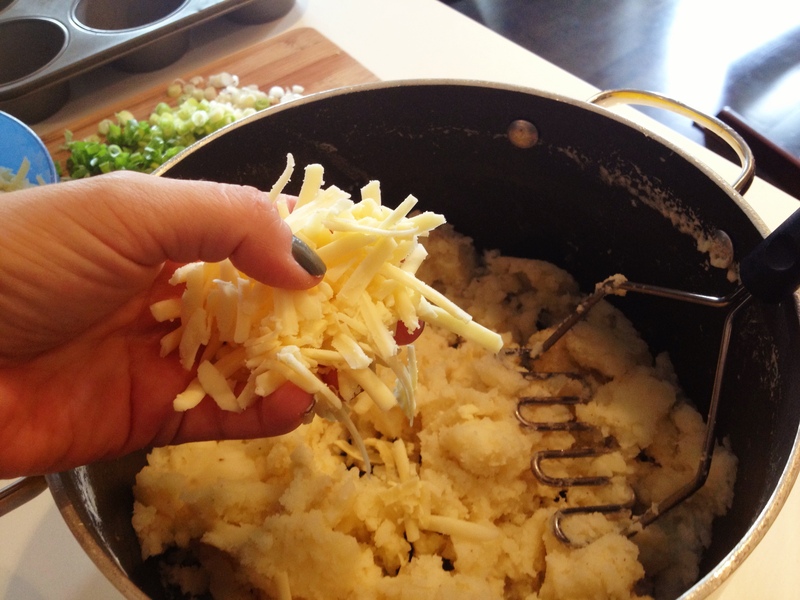 I know everyone has their own special way of making mashed potatoes and that’s fine. I am a supporter of tradition but this is my little recipe and I need to give you one cardinal rule when making this…are you ready? 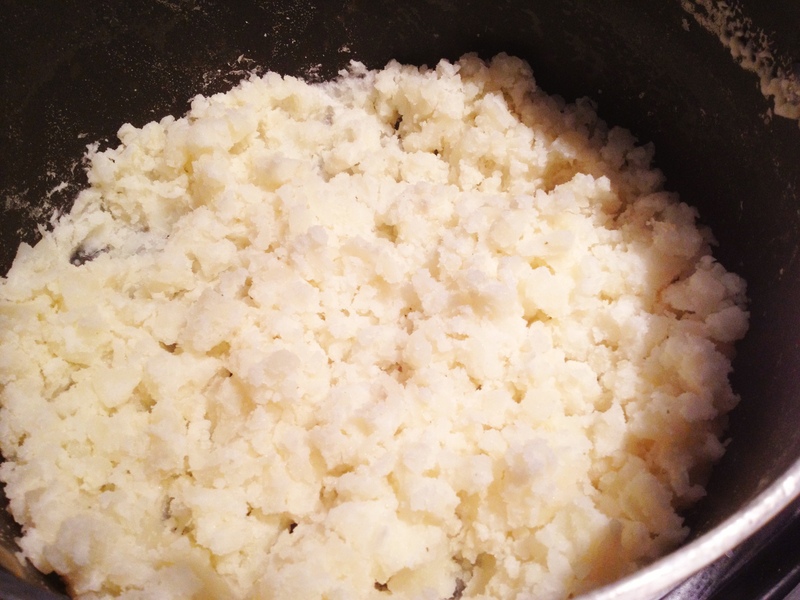 When you are mashing the potatoes, Do not, I repeat DO NOT ADD MILK to the potato mixture. You don’t want these to be too runny and it just doesn’t work. If you do decide to add milk, you are pretty much asking to kinda mess it up…just sayin’. See how angry I got there?? 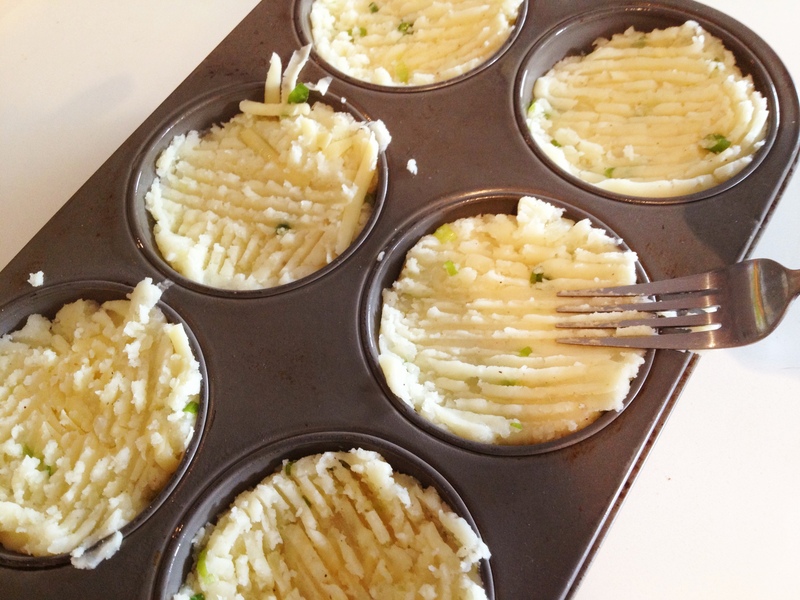 Next, grease a muffin tin. I like to use spray olive oil. 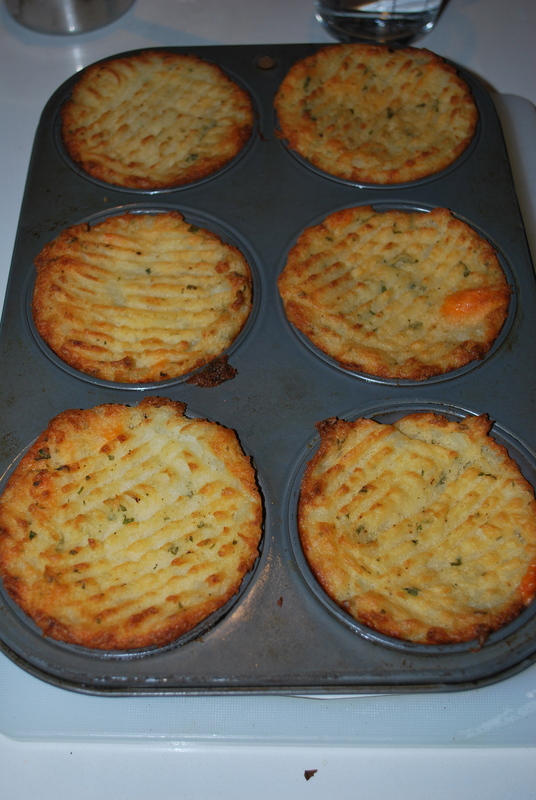 Add the potato mixture to each muffin and pile to the top. Pack it down a bit. Now, melt a bit of butter (just throw it in the microwave for a few seconds) or if you don’t have butter, you can use oil. Brush the tops of the potatoes with the melted butter or oil (or you could use a spray EVOO) This is going to make these babies brown up nice and golden. This means you are about to experience next level spuds, all your dreams of holiday roasted potatoes mixed with the internal struggle that is the mashed potato. You no longer have to make those decisions people, these potatoes will make everyone at your holiday table happy…even a non potato eater!!! Next place in to a preheated oven at 375-400 for about 20-30 minutes, depending on how crunchy and golden you want them to be. 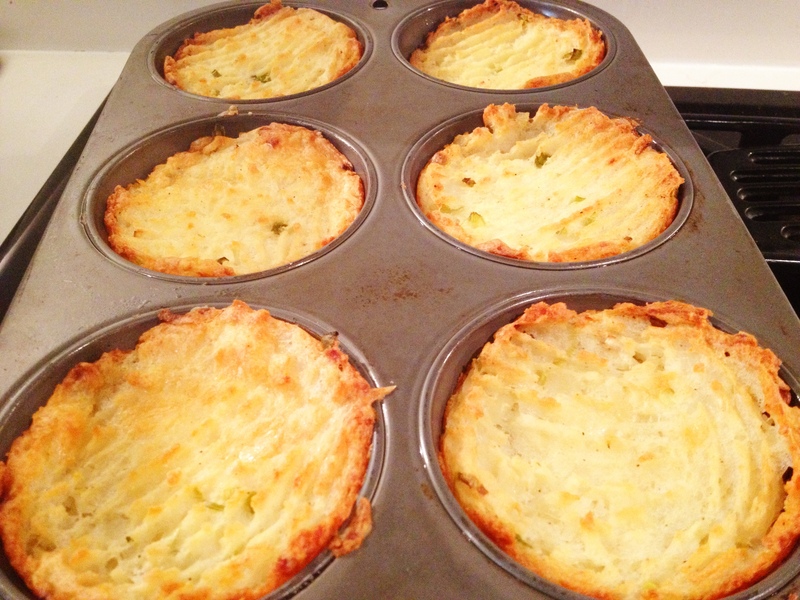 Bake at 400 degrees for 35-45 minutes or until desired crispness. I really hope you enjoy these potatoes! This one is for Janette!!! These are a great dish to make up a head of time, before company comes over, have everything cleaned up and all you really have to do is pop them in the oven to bake/crisp up. They are also the perfect little cup to put on your plate, make a little well in the centre and pour a lil gravy in there…let’s just say, it’s been done in my household. Hope your upcoming thanksgiving is awesome!! Try these lil bad boys out and let me know what you think!! !